I thought I would share a couple of visual greenness maps sent to me by JD Carlson in Biosystems and Ag Engineering. 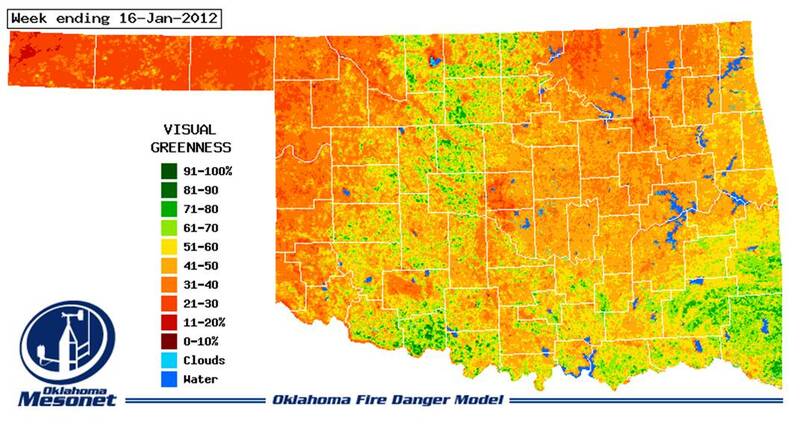 These are from the Oklahoma Mesonet fire danger model site and provide a visual estimate of green vegetation for mid January 2012 (top) and 2013 (bottom). 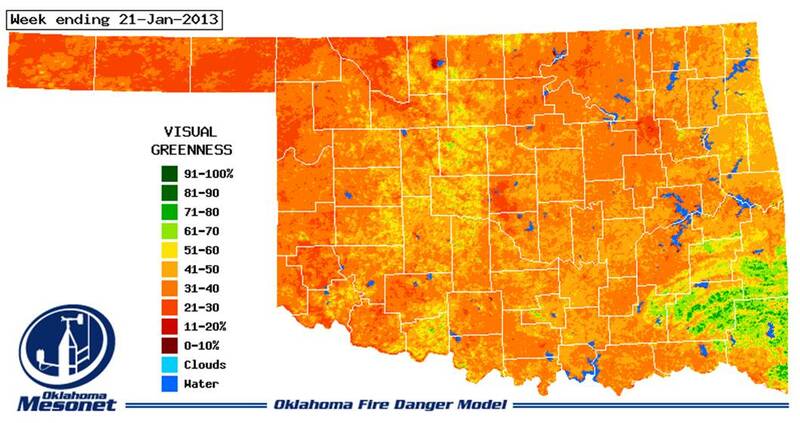 Note the stark contrast in greenness throughout the wheat belt of western Oklahoma. As indicated in the 2013 map, there are some small pockets of wheat with ample stands and average yield potential, but these are not large enough to make up for all of the red. There are more questions than answers when it comes to application of drilling mud to agricultural land. The list of questions expands when the drilling mud is being applied to an established annual crop, such as wheat. We simply do not have enough information to know how a growing crop will respond to drilling mud application from different sources and at different application timings. If current conditions continue it is highly likely that many Oklahoma wheat farmers will rely on crop insurance to cash flow through 2013. Therefore, wheat farmers should check with their crop insurance provider prior to applying drilling mud to established wheat to see how application of these materials will affect their coverage. Tenants should discuss application of drilling mud with landowners and it is a good idea to address these issue in writing in the lease agreement.